'FASTEST' captures a pivotal moment in the sport. 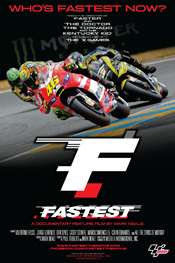 Chasing his tenth world title, the legendary Valentino Rossi runs into the toughest challenge of his life: a wave of ferociously fast young riders, a horrific, leg-shattering crash at the Italian grand prix, an agonizing comeback forty-one days later in Germany, and the question every rider – even the greatest of all time – must face. In 2010, Jorge Lorenzo stole the MotoGP crown. 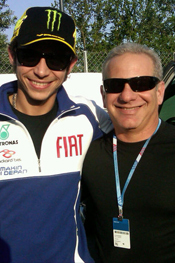 But is Rossi still the king? 'FASTEST'. The greatest feeling. The greatest risk. Mark Neale has worked with artists including U2, Peter Gabriel, John Paul Jones of Led Zeppelin, Paul Weller, William Gibson, La Fura Dels Baus and Valentino Rossi. He has won multiple awards for his films ('FASTER' and 'The Doctor, The Tornado & The Kentucky Kid') and music videos (U2's Lemon and Stay). A UK native, Neale has lived in Holland, Germany, France, Spain and the USA, gravitating towards warmer countries where the weather is better for motorcycling. He also likes playing the guitar very loud and wants to live in Italy next. 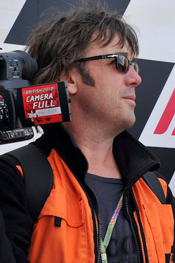 Paul Taublieb is an award-winning producer specializing in motorsports and action sports. He was a consultant on the creation of the X Games and still produces all motorcycle content for that property, producer of NASCAR and TORC racing, created and executed numerous world-record stunts, original content creation for Monster Energy and is currently producing a feature film with Spyglass Entertainment. A former touring surfer, he lives in Malibu, CA and still gets in the water as often as possible.